Last weekend marked the anniversary of Hurricane Harvey making landfall in Texas. It’s hard to believe that a year has passed already. For many, even for those of us who were forced to evacuate our homes, the year has gone quickly. For others, the past 12 months have been a daily reminder, as they continue to work to recover and repair the lingering damage, or to replace things that were lost. For some, the anniversary of Harvey will serve as a permanent reminder of the tragic loss of a loved one. Both of the candidates for US Senate were serving in Washington last year, and each has a record. As summer turns to fall, Texas voters are starting to look more closely at the records of the men running for US Senate. The response to Hurricane Harvey offers a helpful contrast in the philosophy and history of the candidates. Another area of sharp contrast is the response from both candidates to the controversy over professional athletes electing to protest during the National Anthem. Recently a video of comments made by Congressman O’Rourke caught the attention of political observers on both ends of the political spectrum. The comments were no doubt intended to resonate with the radical left that O’Rourke has been playing to for months, but in the process he demonstrated a shocking degree of tone deafness towards those who find the protests offensive. Not satisfied by offering a quick slap in the face to those who do find it offensive, he went on to elaborate. At one point, O’Rourke even claimed “I can think of nothing more American” than kneeling in protest during the National Anthem. When discussing the Congressman’s comments, and specifically the idea that O’Rourke could think of nothing more American than protesting during the National Anthem, Ted replied “well, I can!” He went on to describe the heroic sacrifices made on behalf of liberty and our safety by the men and women in uniform both in the military and law enforcement. Our campaign also released an ad to highlight the differences between Cruz and O’Rourke on the subject. The Ad features remarks made by Sgt. Tim Lee, who lost both legs serving in Vietnam, when he introduced Ted at an event last April. Sgt. 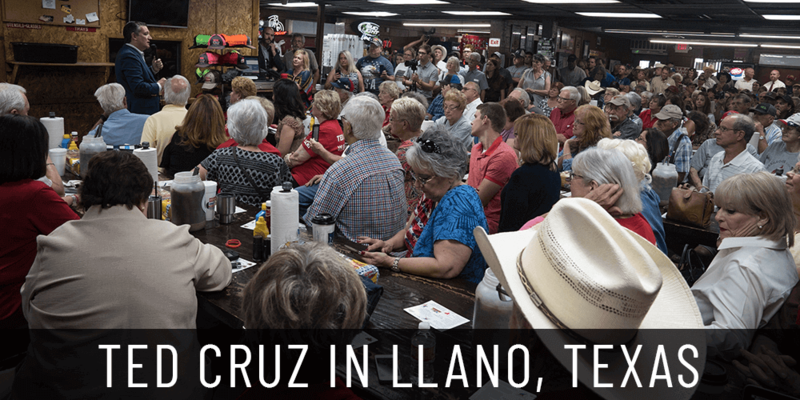 Lee also joined Ted at seven of the fifteen campaign stops he made around Texas this week. Speaking to the crowds, and introducing Ted, Sgt. Lee once again demonstrated his willingness to take action to preserve liberty and promote the patriotism that has defined so much of his life. He understands that the differences between Ted and O’Rourke are dramatic and consequential. Each of the candidates for US Senate in Texas have a record. It’s important for the voters to know where each candidate stands, and what they have done during the 6 years they have both served in Washington. The examples above are just the tip of the iceberg when it comes to the differences between the two. For more information, you can view and download a handy side-by-side comparison of their positions here.